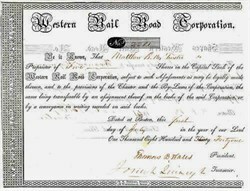 Beautiful stock certificate from the Western Rail Road Corporation issued in 1841. This historic document has an ornate border around it. This item is hand signed by the Company’s President ( Thomas B. Wales )and Treasurer, Josiah Quincy, Jr. and is over 161 years old. The Western Railroad Corporation was chartered in 1833 to develop a line from Worcester to western Massachusetts. They began operations to Springfield in 1841 and later merged with the Boston & Worcester Railroad to form the Boston and Albany Railroad in 1867. Josiah Quincy, Jr. (1802-1882) was mayor of Boston (December 11, 1845 - January 1, 1849), as was his father Josiah Quincy III (mayor 1823-1828) and grandson Josiah Quincy (mayor 1895-1899). He was the author of Figures in the Past (1882). As a member of the Massachusetts State Legislature in 1837, he was instrumental in the establishment of the Massachusetts Board of Education. He built the Josiah Quincy Mansion in 1848. Josiah Quincy, Jr. believed in the Public Boston Library plan so thoroughly that he made the first cash gift to the Boston Library in the sum of $5,000. He made the gift anonymously with the condition that "$10,000 be raised at large for the same purpose and that the library should be as fully used by all, as may be consistent with the safe-keeping of the property." His brother Edmund (1808-1877) was a prominent abolitionist, and author of the biography of his father and of a romance, Wensley (1854). His sister Eliza Susan (1798-1884) was her father's secretary and the biographer of her mother. Josiah Quincy (1802-1882) had two sons — Josiah Phillips (1829-1910), a lawyer, who wrote, besides some verse, The Protection of Majorities (1876) and Double Taxation in Massachusetts (1889); and Samuel Miller (1833-1887), who practised law, wrote on legal subjects, served in the Union army during the Civil War, and was breveted brigadier-general of volunteers in 1865. Josiah Quincy (1859-1919), a son of Josiah Phillips Quincy, was prominent in the Democratic party in Massachusetts, and was mayor of Boston in 1895-1899.